A week or so before Thanksgiving 2010, Robyn and Stephen started chatting online. The day before her birthday, Stephen picked Robyn up in what Robyn called a "shoddy, white, soccer-mom van." They shyly exchanged hellos, he complimented her hoodie, and they walked around the mall. She grabbed his hand to drag him into a store and that moment, according to him, was when he fell in love. He made sure to keep her out past midnight, so he could give her a birthday gift, and was a perfect gentleman. They couldn't wait to see each other again, and two days later they were back at each other's sides. After a second fun date, he looked over at her and asked, "do you want to be my girl?" To which she replied, "tch, obviously." On October 13, 2017, they tied the knot in Roswell, Ga. They wanted a venue that was easy to get to, fit within their limited budget, could support all the components of their wedding, and accommodate their 120 guests. They landed on a community event building with wood and wrought iron designs, and a large balcony overhanging the Chattahoochee River. The venue offered a package that included tables and chairs, 18 hours of use, and few limitations. With confidence, Robyn says, "given the opportunity to do it again, I'd choose it again and again." Robyn sees herself as goth and describes Stephen as "darkly inclined." They are both are drawn to obscura and macabre. 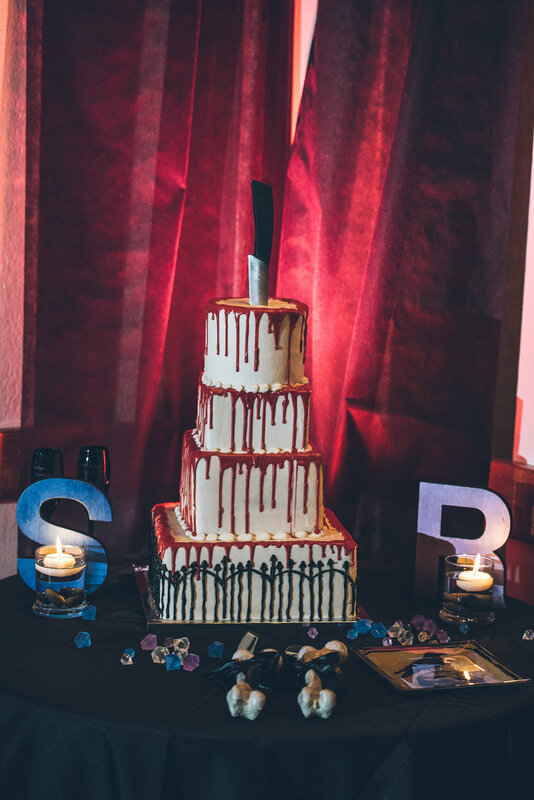 For their wedding, they wanted to tie in their dark, spookier interests with elegance. 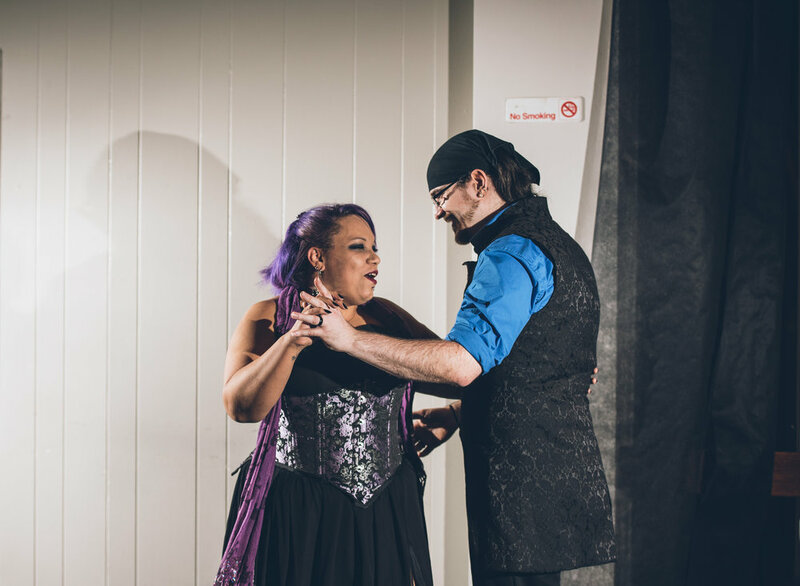 They adore anatomical hearts, so they were featured throughout the venue and they added lots of Victorian flair. 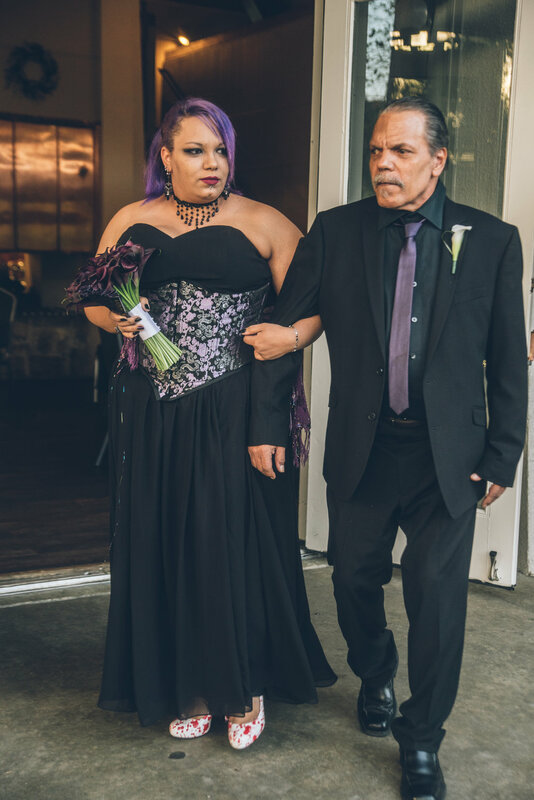 These details were represented in many different elements of their wedding, but most importantly with the bride's dress, from Azazie, which she styled with a corset. Their first look was Robyn's favorite moment. She saw Stephen's eyes light up when he saw her. They were overcome with love, and the room swelled with anticipation for the rest of their forever. 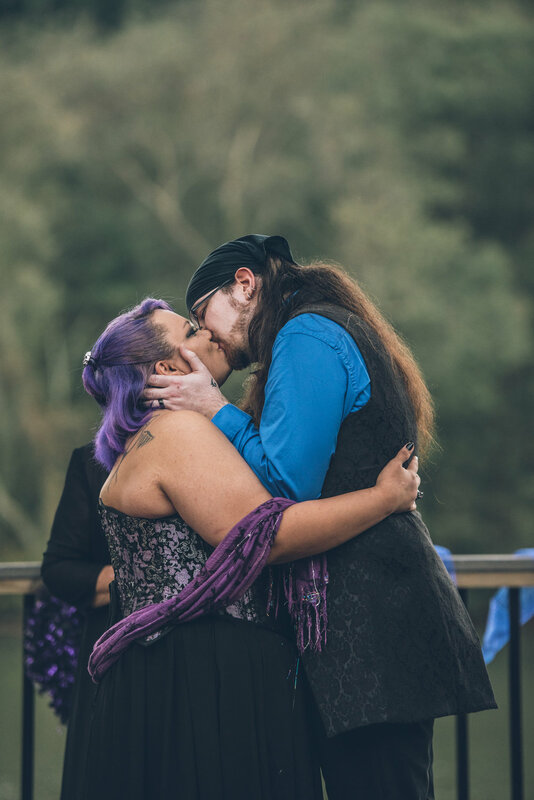 Their ceremony was filled with more purple and lots of smiling. 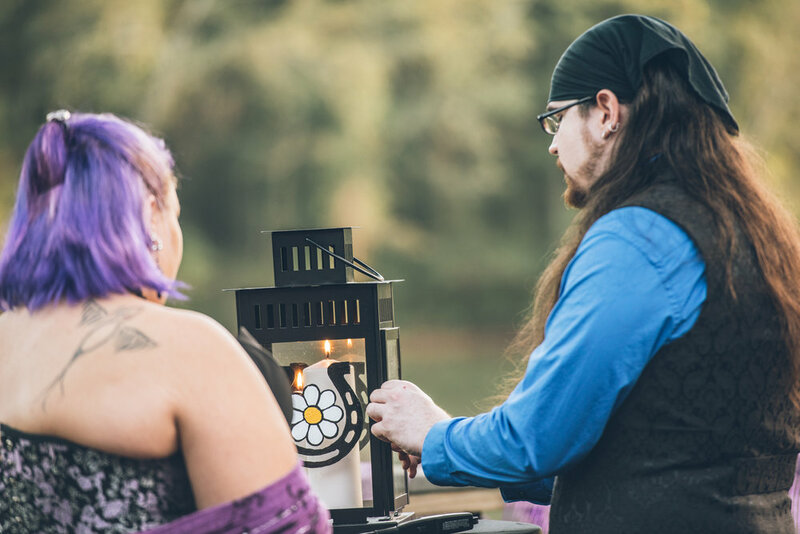 They read their vows to one another and lit a unity candle. 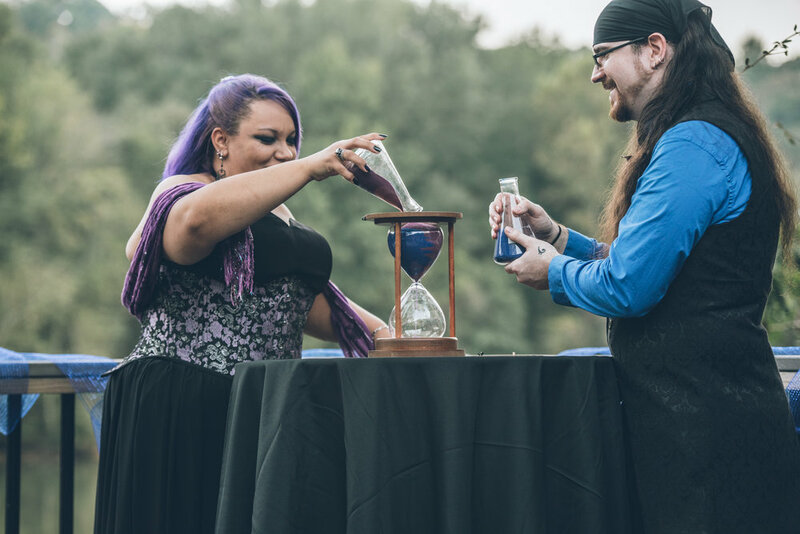 They poured black and purple sand into an hourglass, a beautiful representation of how they blend together and pass through time. Stephen says his favorite moment was when he finally got to kiss her as his wife. As soon as the officiant gave the order, he grabbed her face with both hands and kissed her hard. Their flowers were simple and elegant, with dark purple calla lilies and baby's breath. All the groomsmen had boutonnieres to match with the same calla lilies. Their linens were all black, with white for the food tables. Black gossamer hung in front of the windows. The venue had beautiful chandeliers hanging from the ceiling that complimented their gothic, romantic decor. Robyn made the knife set that went with their cake. It was staged alongside a plate with Poe's "The Raven" on it, with black toasting glasses. All other tables had three vases with floating candles in them on purple chargers. 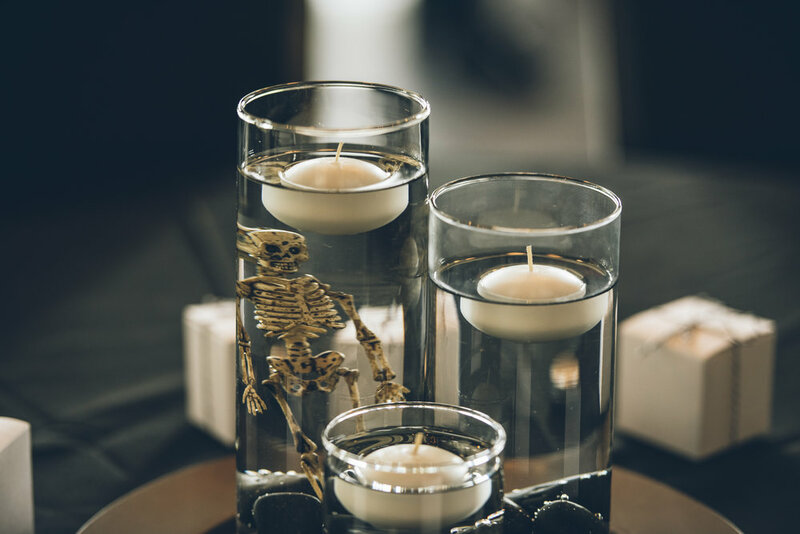 They used skeletons, teeth, and black river rocks as table decor. Robyn made most of their decorations, which helped keep their costs low and their individuality shine through brightly. They added more personal touches to their wedding in the form of favors. Robyn, who is a professional baker, crafted handmade boxes of chocolates shaped into anatomical hearts and brains. She baked them over the course of a week and used about 30 pounds of Belgian dark chocolate, so she could have a box on every chair. Guests went wild for them and even requested them for gifts during holiday season. Robyn felt some pressure to have a more typical wedding, in a big church with a white dress, but felt it was the antithesis of who her and Stephen are as a couple. Her advice to other soon-to-be wed couples would be to not worry abut how "bridal" you are. "You're the one walking down the aisle, up there getting married, how much more bridal do you want to be?" She also adds that if you're a bride on a budget, ask that your friends and family gift their help and services. 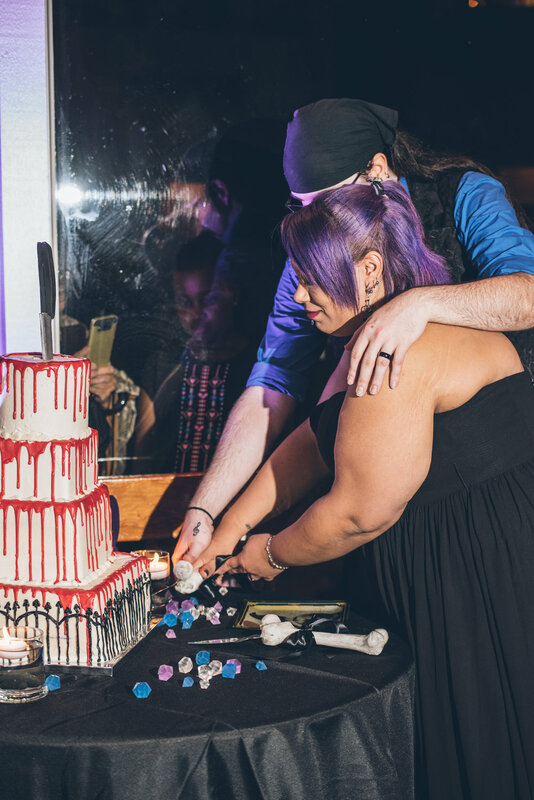 "Our flowers, cake, and catering were all gifts and without it, it would have doubled our budget easily." 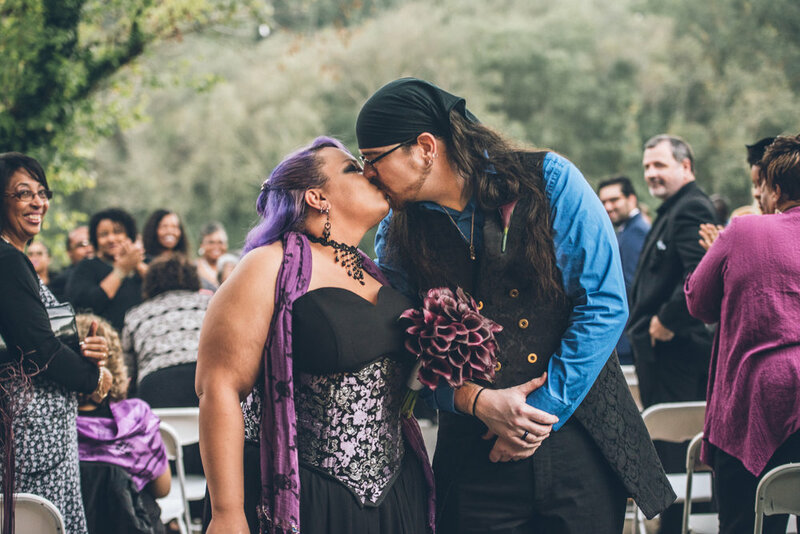 With these gifts, their wedding budget was kept under a modest $6,000, and they got to enjoy all the things that made them the unique, "darkly inspired" people who fell in love when they first held hands. The couple would also like to thank the City of Roswell for use of their building.